Each COM object is registered under its corresponding GUID, together with one or more keys that provide information on the object itself, such as the real path of its specific DLL. Usually, COM objects are registered under the following registry paths: HKLM\SOFTWARE\Classes\CLSID or HKLU\SOFTWARE\Classes\CLSID. There, under the corresponding GUID key, InprocServer, InprocServer32, InprocHandler e InprocHandler32 registry keys are commonly used to provide the object DLL with the paths. If the COM object is under the root HKEY_LOCAL_MACHINE (HLKM), this means that it is available for all users on the computer and has been created thanks to system admin permissions; while those under the root HKEY_CURRENT_USER (HCKU) are valid for the user currently authenticated and not necessarily created by an admin. The COM Hijacking technique to achieve persistence brings several advantages against the remaining traditional techniques to boot the system. The best way is to have a native COM object, called every time the system is boosted. The main problem here is that native COM objects are usually located on HKCR (classes root) instead of on the user’s own registry, so a user on its own should not be able to access it. Consequently, to perform the hijack over the native COM object on Windows, the key may be created as shown in the following image, where you can observe how it is immediately spread. Since we work over HKEY_CURRENT_USER (HKCU), no admin permissions are needed to perform the attack. Once the registry key created, the code within the entered DLL will be executed each time the vulnerable application finds the kidnapped COM object and loads the malicious DLL. Once the vulnerable process called, this will find the COM object (that in principle has not been allocated) and will execute the malicious DLL: in this case a meterpreter shell located on "C:\MisDLLs\epp1.dll"
As the vulnerable process is elevated and has high-integrity level, the provided shell will have SYSTEM privileges without problems. A similar technique has been used to avoid UAC. 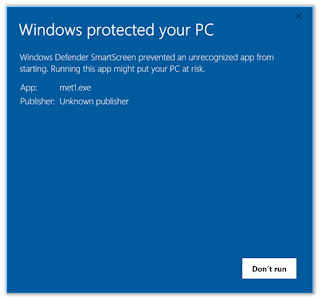 Some time ago we discovered how attackers were able to avoid SmartScreen by taking advantage of DLL Hijacking techniques. This approach manages similar effects, but in a different manner. 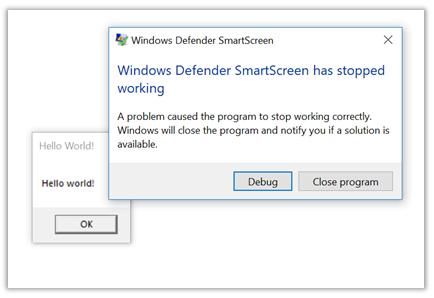 Every time a program is executed on Windows, SmartScreen is executed in order to protect us. No matter what program it is, every execution goes over SmartScreen, that queries on the cloud if the program might result in a risk for the system.. Following the execution of the previous script, any program executed by the user will execute SmartScreen, and in turn such process will load and execute the malicious DLL, so returning a meterpreter shell. For the proof of concept, we simply used a DLL that displayed a “Hello world!”, letting die the process that is supposed to protect us. It may be used for bypassing and persistence too. We have informed Microsoft about this issue. They answered this behavior is by desing.